Brunch & Concert: 11:00 a.m. - 2:00 p.m.
After Party: 2:00 p.m. - 5:00 p.m.
Self, street and parking lots available. Follow us and tag your photos. Performance line-up subject to change. No reserved seating. First come, first served. Brunch service 11:00 a.m.- 1:00 p.m. only. Elevator and wheelchair access unavailable at venue. All ticket sales are final and go toward the costs of the event production, excluding a portion of the proceeds that will be donated to the MOJAMOJA Innovation Fund. No portion of ticket sales are tax deductible. Let’s celebrate! During the last decade influencers, music lovers, and philanthropists have come together at the annual MOJAMOJA Brunch and Benefit concert. We’ve had some good times with great people, honoring musical legends, and iconic performers. Whether it was Janelle Monáe jumping on a table during her performance at our first event in 2009 or the surprise appearance by Sly Stone in 2013, and Anderson .Paak wowing the crowd at the afterparty in 2015. 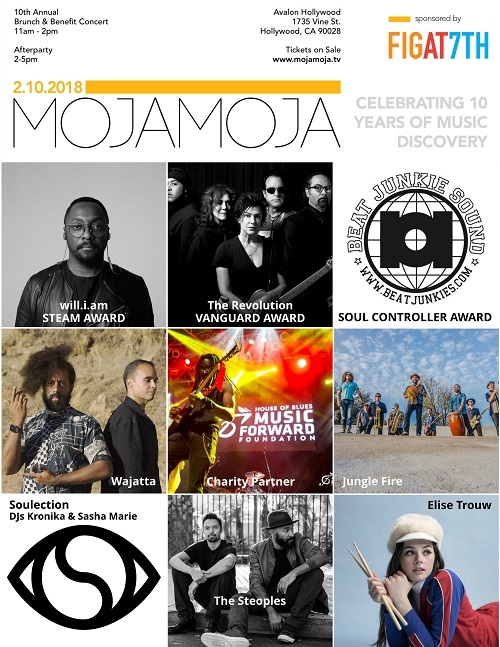 MojaMoja has featured musical performances by our favorite established artists and the best breakout talent from around the world. We don’t want you to miss it! Join us this year at MojaMoja’s 10th Anniversary at the iconic AVALON Hollywood…for another memorable brunch, concert, and afterparty featuring great food and curated concert performances from some the industry’s most celebrated acts. The event will benefit the MojaMoja Innovation Fund. Artists unite and donate performances to raise awareness and funds for the MojaMoja Innovation Fund at Liberty Hill Foundation; which supports initiatives and nonprofits empowering underrepresented, multicultural youth to pursue education, internships and job preparedness opportunities in science, technology, engineering, art and mathematics (STEAM). Your question has been sent to the event organizer. Thank you. © Copyright 2013 World Travel Media LLC. All rights reserved.